Ice, rain, wind, and snow storms are common weather occurrences in Indiana. These inclement weather conditions often cause substantial damage to trees and landscapes. The aftermath of such storms leaves behind broken limbs and branches, scattered foliage, damaged tree bark, split tree trunks, bent or fallen trees, property damage, and more. Not only are these damages unsettling and unsightly, they can pose a threat of safety for people and surrounding structures. For this reason, it is vital to have landscaping trees evaluated and serviced after a severe storm. 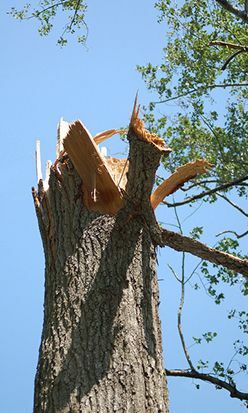 Complete Tree Care provides storm damage clean up and clearance, as well as, emergency tree services for severe weather and storms in Indianapolis and its surrounding areas. For more than 30 years, our professional tree specialists have helped thousands of residential and commercial properties recover after a damaging storm. We use a combination of quality equipment and years of experience to safely cleanup after a destructive storm. Call our office at 317-783-2518 if you wish to hear more information about our storm damage services, prices, and availability today. Call Complete Tree Care at 317-783-2518 for Storm Damage clean up in Central Indiana!